Maldives is perhaps the most striking archetype of jarring apposition and contradiction I've ever encountered. But other than a means of income for many locals, these resorts have very, very little to do with the local way of life. The country itself is a strictly Muslim country—meaning its laws are based on Islam. It's not the first Muslim country I've kicked around. Turkey, my whereabouts a few weeks prior to landing in Maldives, is considered Muslim. But Turkey is a secular Muslim country; its laws are not attached to Islam. 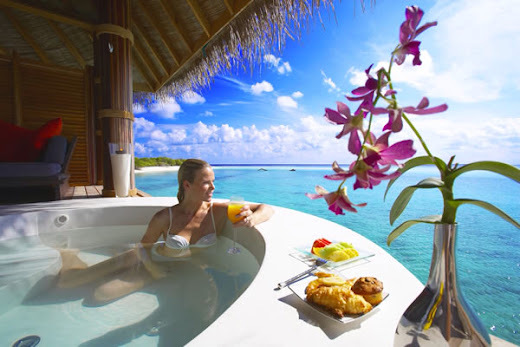 When I arrived in Male with my travel partner, Kady, my demeanor, which had grown uncharacteristically guarded during our exhaustive and harried stint in Sri Lanka, loosened immediately. We descended the plane and walked across the Tarmac into the main building. Passport control met us with shrugs even though we were vague about our destination's address and couldn't recall the number of days we were staying. The sole sales pitch we received was so unintrusive we couldn't really call it a pitch, and we were neither harassed nor followed by any taxi drivers—one of the primary roots of the hostility we'd inadvertently adopted in Sri Lanka. So depending on the mood of customs, had our bags been searched and had something like a Bible or a small Buddha statue been found, they would have been confiscated and possibly destroyed. To be a citizen of the Maldives, you must be Muslim. There are no dogs allowed in Maldives (dogs are unclean in Islam). A few Maldivians have renounced their Muslim faith. Then, they quickly un-renounced their Muslim faith. Lynching is the punishment for those who openly and defiantly oppose Islam. 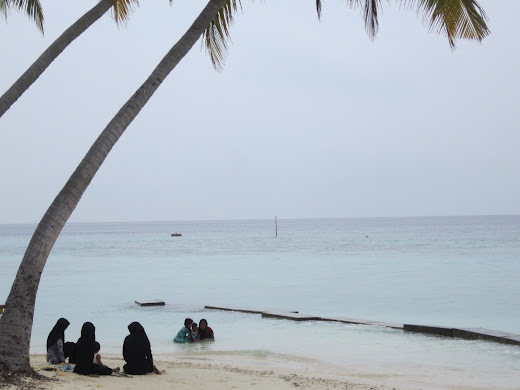 All of the women on the smaller inhabited island of Gaafaru, which we visited as guests of a warm and generous family, wore the hijab (head scarf) and black, long-sleeved, ankle-length dresses...in sweltering, dripping-wet heat. 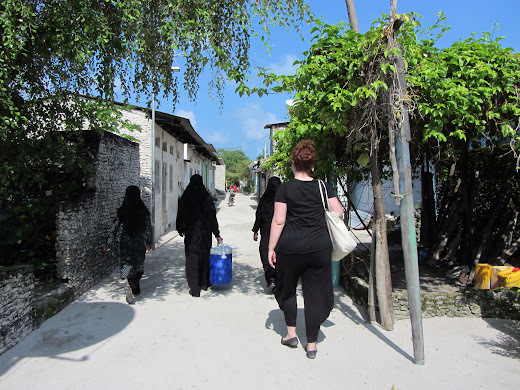 In Male, we saw lots of women without head scarfs and dressed in a wide variety of fashions, though many of them were expats and not citizens. Maldives beats out Belarus and the US (number 2 and 3 respectively) to hold the world's highest divorce rate. Women who have a child out of wedlock receive 40 lashes after giving birth. The men are not punished, and no effort is made to identify the father. If a woman attorney were to become pregnant out of wedlock, she would be disbarred and could never again practice law. Even 40 years later. “You two don't fit any American stereotypes,” said the nephew of our host. “I would guess you at 23 or 24,” said a man I almost proposed marriage to. 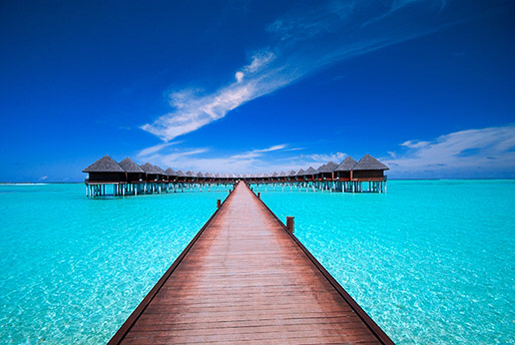 The Republic of Maldives is made up of 26 atolls that contain more than 1100 coral islands. There are around 200 inhabited islands. These islands are home to both natives and expats, and all of the Islam-based laws I mentioned are strictly enforced. A large number of islands are uninhabited; they are either tiny sandbars or used for things like agriculture or manufacturing. The remaining islands are resorts: an entire island that is self-functioning with its own accommodations, restaurants, water supply and more. On these islands, women are allowed to wear bikinis, and alcohol is available. These islands are owned by all sorts—from the Four Seasons to some weird Texan I kept hearing about—and rooms run anywhere from $80 to several thousand dollars a night. 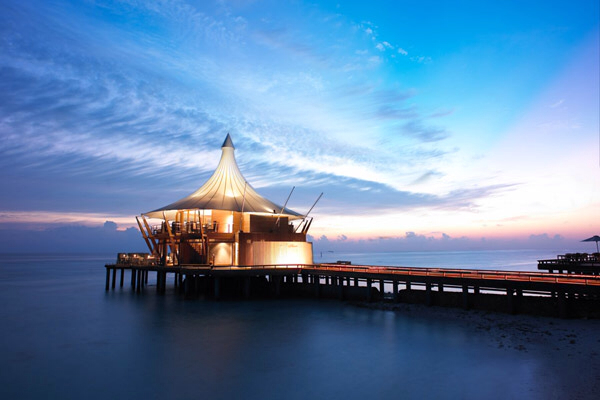 And though the staff is made up mostly of native Maldivians, many of the resorts do not allow locals to visit as guests. I was horrified when I learned this. My dinner companion (and informant), a professional 30-year-old native-Maldivian woman who does not wear the hijab, finds it as upsetting as I do. I asked him if he found it offensive or terribly oppressive to have to see women in bikinis. “No, I love it!” he managed to exclaim with the innocence of a 10-year-old boy. On Gaafaru in particular, Kady and I never quite grew accustomed to the image of women in long black dresses and hijabs standing amid the tropical scenery. Our young host on Gaafaru, Mifu, said that women began dressing more and more this way after the tsunami of 2005—an event many saw as an act of God and referred to as “judgment day.” But at the same time, he said that for most, it was a fashion statement: “Makes you look thin,” he said. I'm going to claim it adds 50 pounds. Let me be honest: Sure, I am a tolerant and open-minded person (perhaps a bit of a, dare I say, relativist) but I struggle with my prejudices and assumptions just like any other. I could swim in a sea of burkas for a year, but I will still find the garb startling and fight the presumption that the burka-clad woman is being mistreated at home. That's on me. That is my bias with which I struggle. Contradictorily, I am the enduring champion of the underdog. When I'm in the United States, the Muslim population is the underdog, and I recoil at the ignorance that inundates them (“Keep those terrorists out of our country!”). I am repulsed when their freedom to worship in their way is challenged—huge communities rallying together to protest the building of mosques, etc., and I feel embarrassed by what can only be described as prejudiced, anti-Muslim propaganda—no matter how subtle. But then it would strike me: here I am in a country where it is illegal for me to worship the way I worship. Where I enjoyed prawns seaside with a local Maldivian woman who works as an attorney while she interpreted a nearby rally that Kady and I found infinitely unsettling. Speaking was a man with a long white beard, commanding gesticulations and abrasive, halting speech. “The west is evil, blah blah blah,” said our attorney friend, waving her hand through the air and rolling her eyes. She told us of a parliament member who recently made the public statement that women should stay home. “Psh, I think he can stay at home,” she said. “We...picked the wrong island,” I muttered to the waiter. I mean I haven't worn a two-piece in public since I was a toddler, but I'd been fantasizing about a gin and tonic for a week. The next morning, I ate my free continental breakfast—eggs a bit too runny with a side of what can only be described as hot dogs (of the non-pork variety, of course). 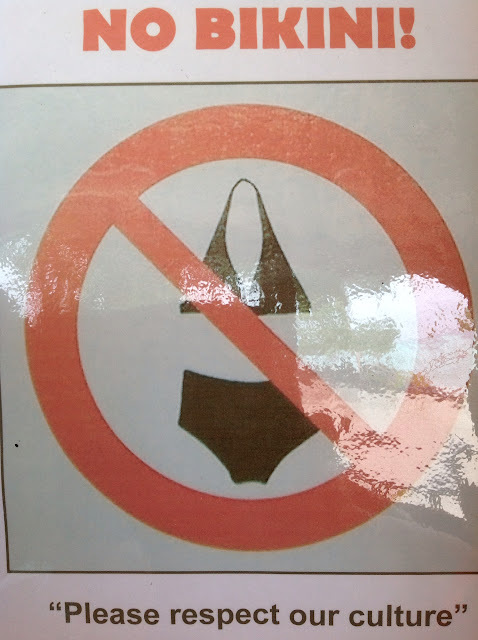 I looked out over the ocean and spotted three or four big ol' blatantly white thong butts—irreverent flesh taunting the rules' enforcers. Mildly repulsed at the display, my mouth curled into a frown. And there I was once again—taken aback by a jarring juxtaposition and swimming in a sea of my own prejudices and assumptions. I love these posts so, so much! I was really curious about how swimming and hair was going to be on the islands where people live, as well as the contrast of the resort islands. 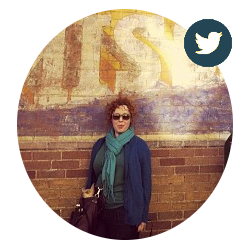 Thanks a ton for sharing this info and these important insights. I have been thinking a lot about this post ever since I read it. Specifically the religious aspect of it. I recently heard an experience about how dangerous it is for Iranians to renounce their Muslim faith. For reasons that have NO basis in logic, it seems more incomprehensible (to me) when it happens in a tropical paradise.